Leading Manufacturer of heavy embroidered sarees, georgette printed saree, designer sarees, banarasi saree, georgette saree and fashionable designer saree from Surat. Owing to our expertise in this domain, we are engaged in providing an array of Fashionable Designer Saree which has embroidery work on in floral pattern. 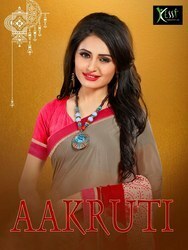 This designer saree is completely checked by quality controllers in order to supply a defect free range. The offered designer saree is designed using optimum quality fabrics & modern techniques as per the latest trends of market. Furthermore, we are giving this designer saree on numerous customized options as per the demand of customers. Description: This Fashionable Straight Suit in Pink Color Top ,White Bottom And Dupatta with Heavy Pattern Embroidery Work On It.It Contain with Georgette Top , Shantoon Bottom,And Chiffon Dupatta.This Classic Indian Style Patiala Suit Gives Gorgeous Look For Party,Wedding . The offer qualitative product is strictly tested by our quality experts on various parameters in order to ensure that we provide high grade products to our clients. Description: This Exclusive Red With Beige Pallu Color which give gorgeous look ,this designer saree embroidery work on in floral pattern.Saree is especially ready for any ceremony. Description: This Exclusive Blue With Red and Beige Pallu Color which give gorgeous look ,this designer saree embroidery work on in floral pattern.Saree is especially ready for any ceremony. Description: This Exclusive Yellow With Red Pallu Color which give gorgeous look ,this designer saree embroidery work on in floral pattern.Saree is especially ready for any ceremony. Description: This Exclusive Saree Blue Color which give gorgeous look ,this designer saree embroidery work on in floral pattern.Saree is especially ready for any ceremony. Owing to the immense experience in this domain, we are providing an excellent range of Designer Saree With Heavy Embroidery. Our given designer saree is high on demand among our customers for its perfect finish. This designer saree is designed utilizing top quality fabric as per the set quality norms. 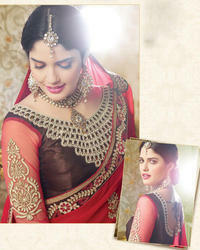 The given designer saree is obtainable with us in various customized options as per market demand. Description: This Exclusive Saree Beige and Red Color which give gorgeous look ,this designer saree embroidery work on in floral pattern.Saree is especially ready for any ceremony. Description: This Exclusive Saree Brown With Pink Pallu Color which give gorgeous look ,this designer saree embroidery work on in floral pattern.Saree is especially ready for any ceremony. Description: This Exclusive Multicolor Color which give gorgeous look ,this designer saree embroidery work on in floral pattern.Saree is especially ready for any ceremony. Description: This Exclusive Saree Grey With Pink Pallu Color which give gorgeous look ,this designer saree embroidery work on in floral pattern.Saree is especially ready for any ceremony. Description: This Exclusive Saree Multicolor with Dark Brown Pallu Color which give gorgeous look ,this designer saree embroidery work on in floral pattern.Saree is especially ready for any ceremony. Our firm is counted amongst the significant names, offering a wide range of excellent quality Designer Saree With Patch Work that is perfect for special occasions such as party and marriages. This saree is designed using premium quality fabric and advanced stitching technology in adherence with the set industry norms. The offered saree can also be availed in different designs and colors as per the requirements of our clients. Description: This Exclusive Saree Red and Brown Color which give gorgeous look ,this designer saree embroidery work on in floral pattern.Saree is especially ready for any ceremony. Description: This Exclusive Saree pink Orange Color which give gorgeous look ,this designer saree embroidery work on in floral pattern.Saree is especially ready for any ceremony. Description: This Exclusive Saree Beige and Pink Orange Pallu Color which give gorgeous look ,this designer saree embroidery work on in floral pattern.Saree is especially ready for any ceremony. Description: This Exclusive Saree Black With Beige Pallu Color which give gorgeous look ,this designer saree embroidery work on in floral pattern.Saree is especially ready for any ceremony. Description: This Exclusive Saree is made of Georgette Fabric in PurleColor which give gorgeous look ,this designer saree embroidery work on in floral pattern.And these saree is especially ready for any ceremony. To meet our client’s requirement in a satisfactory manner, we are engaged in offering a wide collection of Fancy Designer Saree. Our offered saree is crafted using superior quality fabric and sophisticated technology in compliance with the latest market trends. 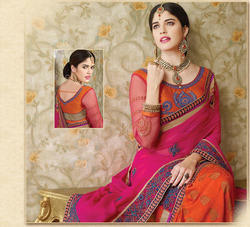 Offered range of saree is extremely comfortable and can be worn on any occasion. Apart from this, the saree offered by us is tested by our quality controller to deliver defect free range at clients' end. Description: This Exclusive Saree Multicolor With Maroon Pallu Color which give gorgeous look ,this designer saree embroidery work on in floral pattern.Saree is especially ready for any ceremony. Being a quality-centric organization, we are offering a vast spectrum of Lehenga Saree that is available in various colours and designs as per clients’ requirements. The offered saree is acknowledged for its exquisite design and beautiful pattern and extensively demanded all around the nation. Our offered saree is tailored by our skilled professionals with utmost care. Further, this saree is tested on various quality parameters to ensure that we are offering a defect free range to our clients. We are offering Cotton Silk Sarees to our valuable customers while keeping in mind their demand. We offer product to meet the satisfaction of customers by our best product.